As a parent, you take pride in ensuring that your child develops a healthy, beautiful smile. 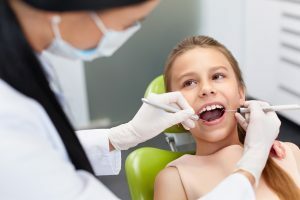 You encourage the proper oral hygiene habits at home and take them to see their children’s dentist in Oklahoma City twice a year. Despite your best efforts, there is a danger lingering in their mouth—bacteria. Bacteria are found in everyone’s mouth. If it is not removed by brushing and flossing, it will continue to sit on your child’s teeth. When it combines with their saliva, it will turn into acid, slowly eating away at their enamel until a cavity develops. To provide your child with an added layer of protection against tooth decay, it is time to ask your dentist about a fluoride treatment.